Dn. Michael Hyatt teaches through the book Great Lent by Fr. Alexander Schmemann. Dn. Michael begins a new series based on Fr. 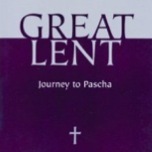 Alexander Schmemann's book Great Lent: Journey to Pascha. Dn. Michael discusses the five Sundays that precede the start of Great Lent. Dn. Michael continues his discussion of the five Sundays that precede the start of Great Lent. Dn. Michael considers four aspects of Lenten worship: atmosphere, prayer, Scripture, and hymns. Dn. Michael begins discussing the Liturgy of the Presanctified Gifts. Dn. Michael reminds us that it is only by knowing the way that we make it to Pascha. Dn. Michael asks the question, "How can we apply Fr. Alexander's teachings on Great Lent to our lives?" In the final episode in the study of Fr. Alexander Schmemann's book Great Lent: Journey to Pascha, Dn. Michael discusses the Appendix where Fr. Alexander talks about the importance of frequent communion.